Straight black, double espresso, or decaf soy milk latte vanilla grande1? For thousands of farmers around the globe, coffee is not a question of taste (or style), but one of survival. The following is a short introduction into “Coffee Economics 101,” the promises of fair-trade and organic, and the $500-plus million bet by the Swiss food giant Nestlé. Global trade in coffee has changed dramatically over the years. Coffee was once almost exclusively traded as a commodity – with little concern for origin or quality. But in the “new coffee world,” a variety of models have emerged that offer opportunities for farmers. Coffee brewers, both international and national chains, were among the first starting to buy “speciality coffee” of higher quality. Stores like Juan Valdez, Colombia, or producers like Café Britt, Costa Rica, have raised awareness for coffee quality in their countries of origin. Today, small coffee roasters cater to coffee connoisseurs, distributed through new channels like the Black Pirate Coffee Crew. 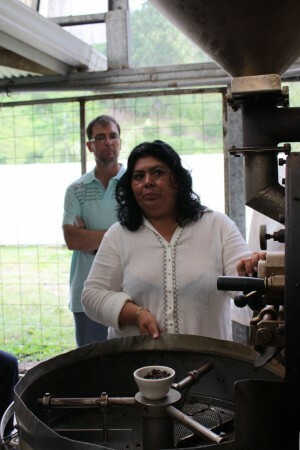 (Left: Few producers roast their coffee, but the women of the APOT Coffee Cooperative, Costa Rica, do. Image credit: © Anand Sheombar 2010). Still, in all cases, coffee is traded along long and complex value chains that reach from the coffee plantation to the cup, which has resulted in farmers capturing only a small part of what consumers are willing to pay. Growing coffee is a difficult business – new plants take four years to yield coffee, and six to eight until they reach their real productivity. Once coffee trees age, their productivity declines. Coffee farmers therefore must continuously invest in the re-planting of new trees – and they need to bridge the income gap until those plants bear fruit. As coffee can be an attractive source of foreign exchange, new producer countries like Vietnam entered the coffee game; coffee prices had come down to 0.45 USD/lb (but have since recovered to their 2000 levels). With these price fluctuations, farmers have come under pressure in traditional coffee producing countries in recent years. While the prices have recovered, the weak position of farmers in the value chain continues, together with their precarious economic situation. Certification could be one way out. Growing attention to the environmental and societal conditions of coffee production have driven consumer awareness and demand for organic and fair-trade coffee. As a consequence, one option advocated to farmers to improve their situation is making production more sustainable, and obtaining a “certification” for it. Organic certification has a focus on environmental issues, while fair-trade coffee directly seeks to support farmers by long-term contracts and premium prices. Two prominent options – but how promising are they in eliminating poverty? Research conducted by the INCAE business school suggests: “it depends.” The equation boils down to the good old cost/revenue argument, plus a question on scale. On the revenue side, certification helps farmers to get more money in for their crop. At their time of study (2004), farmers could expect to get an additional 0.15-0.25 USD/lb for organic, or 0.62 USD/lb for fair-trade coffee on the market price of 0.70 (assuming they found a buyer, more on that below). Organic price premiums show a larger spread, from 0.05 USD up to 1.50 USD earned by some farmers (fair trade premiums are between 0.56 and 1.06 USD). But the challenges arise on the cost side, with regard to both input costs and productivity. While they compare only four countries, productivity tends be flat, but costs tend to rise (significantly). Costa Rica, which has more advanced coffee farmers (more fertilizer, better technology and near-ideal conditions), is a special case. While costs rose only modestly (from already relatively high levels), productivity went down significantly. As a result, additional costs for organic production ate up a good part of the price premium in Costa Rica (91 percent) and Guatemala (82 percent), while the costs are even higher then revenue premiums in Honduras (by 95 percent) and El Salvador (by 33 percent). In the later countries, certifications actually leave farmers off worse then before. And the problems did not stop here. First, certified coffee areas only covered relatively small areas in the respective countries (usually, no more then 2 percent for organic and fair-trade coffee, with strong overlaps). Second, the amount of certified coffee grown exceeded the amount of certified coffee sold in many years. In 2002, it was three-fold, leaving farmers with the only option to sell their produce as “normal” coffee. This means that while they don’t get a price premium, they still having to pay the (significant) certification costs. With organic and fair-trade certification not being the silver bullet they were as advertised as, what could be a way out? Direct purchase: A doubling of direct purchasing from coffee farmers, to 180,000 tons per year. Standards: Nestlé wants to introduce the “4C sustainability standards” for all direct purchases, and subject a further 90,000 tons to the standards of the rainforest alliance. The plan has been announced as a global initiative and is now being implemented in different countries (among them, coffee champion Colombia). There also is a cosy corporate video featuring happy farmers and coffee drinkers (and slightly off translations, at least on the Spanish part that I can check…). Good for farmers? Good for Nestlé? Good for both? Is it good for farmers? First, large-scale investments into a more “inclusive supply chain” are a good thing, and the amount indicates a large-scale initiative, even for a giant like Nestlé. And as over-aging of trees and under-investment is a problem for many small farmers, planting new coffee plants surely will help. But what about the direct purchase? It has the advantage to cut out intermediaries, leaving more on the table for both parties. Still, the plan does not talk about (or commit) to paying farmers premium prices for their produce. Also, it comes at a time of record coffee prices that create pressure on corporate profits and might lead to a search for cost-cutting options. For farmers, direct purchases might exchange one evil for the other. If “direct purchases” leads to the withdrawal of traditional intermediaries, would it leave farmers with no option but selling to Nestlé in the future? Would farmers still benefit from further price rises, assuming the year-long trend in rising coffee prices continues? Questions continue on the standards applied. While the scale of production that shall be subject to the criteria is significant, the standards themselves are not. Even by the 4C Coffee Association, the basic criteria Nestlé wants to apply are described as “baseline standard for the sustainable coffee supply chain,” and positioned as a “stepping stone towards more demanding systems.” And the Rainforest Alliance standards, stricter and more demanding, still lacks minimum prices for farmers and crop pre-financing needed, especially by small scale farmers (see a summary of the critique). The ’scribbled font’ in the corporate video – that looks like straight from a 90s corner-fair-trade-store flyer – and the whole campaign paint the picture of a tree-hugging, fair-trading, world-saving giant. This might not happen to Nestlé overnight. Still, with the worthwhile steps that could resolve some of the plights of poor farmers while securing future coffee supply at reasonable prices, it could be a smart and “enlightened” business move for future plans that are ambitious not only in volume, but also in its measures. For an good in-depth (and in parts technical) study of certification systems see Kilian, Bernard and Lawrence Pratt Connie Jones, Andre’s Villalobos. 2006. “Is Sustainable Agriculture a Viable Strategy to Improve Farm Income in Central America? A Case Study on Coffee” in the Journal of Business Research 59:322-30.